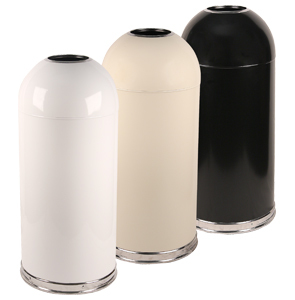 Offering touchless, sanitary and convenient pitch-in open top waste disposal, these standard dome top trash cans are the ideal choice for coffee shops and high volume lobbies. Lift-off lid makes emptying a cinch. The rolled-under stainless steel bottom helps keep floors looking their best.